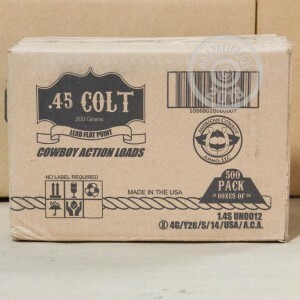 This .45 Colt ammo from American Cowboy is specifically tailored to fit the needs of cowboy action shooters like you. 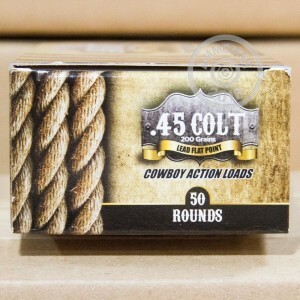 This ammo is loaded with low pressures to reduce recoil with a muzzle velocity of 686 feet per second. 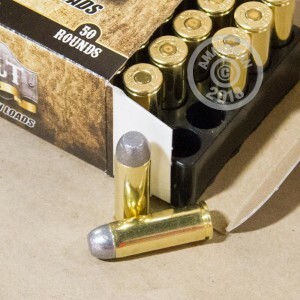 In addition to classics like the Colt SAA, these cartridges will also work in revolvers chambered for .410 shotshells such as the Taurus Judge. Remember to grab more than $99 worth of items at AmmoMan.com to qualify for free shipping! A large intimidating round, but shoots like a creampuff with a nice dull "thud" and low recoil. Low recoil. Enjoyed shooting these American Cowboy 45LC in my Bond Arms derringer. I have shot for 40+ years.....these 45 made the last time out more fun than ever!!! !